i bought 2 for each bed in my house. they memory foam works great, doesn't get soft or out of shape. i have had these for a while and it is still retaining the same shape as when i bought it. 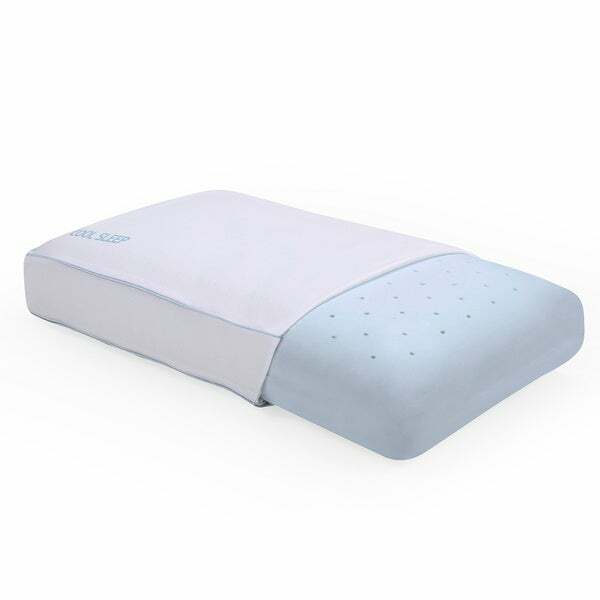 Finally get the sleep you deserve with this PostureLoft ventilated gel memory foam pillow. This Cool Sleep pillow is made of memory foam that is both gel-infused and ventilated, helping the pillow stay much cooler than standard memory foam pillows. This pillow also includes a removable, washable cover made of performance knit Cool Pass fabric, which assists in keeping the pillow cool and comfortable. Arrives tightly packed in a portable box for customer convenience. This product is a good quality memory foam pillow. I have two king size ones, and saw this on sale here and bought two queen size for my new bed. I did let them air out for a few days as there is a slight chemical smell that does go away. To help it, use fabreeze on both sides One other benefit is that you can wash the cover with your bedding, giving you a better pillow comfort and no dust mites or bugs. If you purchase this product I don't think you'll be sorry with your purchase. They do remain cool throughout the night. I am in the throes of menopause and seem to have difficulty in staying asleep at night. Hot flashes interrupt my sleep and the pillows I have used only make it worse. This pillow is billed as a "cool sleep" pillow, so I tried it. I have slept on it three nights now, and have to report that it is a bit cooler than other pillows I have tried. While it is not a "cure" for heat and hot flashes, it seems to be less hot than others. It is soft, yet firm and has that gel memory foam "stiffness", if that is what you are looking for. It's not the most comfortable pillow I have ever slept on, but comfortable enough. I am happy and will be keeping this pillow. I've never had a pillow that stays as cool as this one. Good product and highly recommended! I have budging disks in my neck and since I slept on this pillow I've not awakened once with neck pain. This Ventilated Gel Memory Foam Gusseted Pillow is the most comfortable pillow I have ever had. It is ventilated and very relaxing. I Love it! very comfy, but not as cool as I like. however; much cooler than feather/foam pillows. I was staying with my son (52) that had two strokes after he was hit in the head. He was sleeping in a hospital bed and wasn't allowed to sleep on a pillow. Ok his pillow looked good so I used it while he couldn't . Fantastic! The first night the alerts on his machines, didn't wake me!!! I had never slept like that!! After he was able to go back to his regular bed. That's when I started hunting for the same pillow for myself. Bad Luck! I couldn't seem to find it anywhere. I went online, no luck at first. Then I took a picture of my sons pillow. I looked at more pillows than I believed existed! FINALLY. OVERSTOCK HAD THE PILLOW I WANTED! I ordered it. But when I got it I realized I had ordered the wrong one! I called Overstock. They said, "Ok let's get the other one on the way. (No hassle at all ) IT ARRIVED TODAY. it only taken a very few days. But I've got my pillow, my pillow! I'm am getting ready for bed and silly me I run over and lie on it every time I get a chance! So NOW IM GOING TO BED, KNOWING I WILL BE GETTING A WONDERFUL NIGHTS SLEEP. ( It's MY pillow) THANK YOU! It's just a bad pillow. So this pillow is at first sort of thick, not good for back or stomach sleeping. The foam seems stiff, and the longer I have it the stiffer the foam becomes. No matter how I adjust this pillow I can't get it to provide support for my neck. I find my neck becoming tired because I am unconsciously using my neck muscles to keep my spine aligned. The PostureLoft pillow had the worst off-gassing I have ever smelled when it was new, but this subsides within a couple of months. I wish I had not purchased this pillow, I find most nights I end up throwing it on the floor and using a different pillow. I’m so in love with my gel memory foam pillow firday was my nite using it and I was able to sleep so well that I even overslept for work and didn’t heard my alarm go off lol, it worth the $44 and changes I paid for it.. I don’t remembered the last time I had a good rest. I’m happy and pleased with my purchase and the delivery was fast within less then three days of my order I got both of my packages, my only problem I have is the sell of the gel, but I’m going to machine wash it with tide soap because it’s machine washable. Thank you overstock you guys rock. The pillows do feel cool to the touch but they are much harder than I prefer. I woke up at 4 AM with an awful headache; it was like sleeping on a concrete curb. Not very comfortable. Would not recommend. Holds up very well but much firmer than expected. I haven't noticed staying cooler at night. I am very picky with pillows. I haven't found the right pillow yet. I can't say this is my pillow because it is not. I like it though and the only reason I gave a 5-star rating is because my husband loves it. lol. I bought these pillows as a gift. After they sleep on them they said the support was great but not hard. I could order the size I need. No bad smell. I did get to visit and lay on these pillows and I will get me some new pillows soon. So comfortable and dreamy, love this. "Is this pillow the size of a normal pillow. I bought one similar and it was smaller than the normal size pillow."